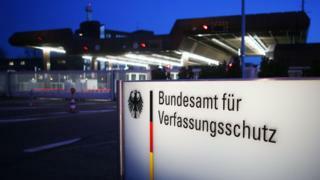 An employee of the German intelligence agency (BfV) has been arrested after making Islamist statements and sharing agency material, German media report. A BfV spokesman did not confirm a report in Die Welt newspaper that the man was suspected of planning a bomb attack on the BfV's Cologne office, Reuters news agency said. "There is no evidence to date that there is a concrete danger," he added. The man is reported to be of Spanish origin and a convert to Islam. The BfV said the suspect, who now has German citizenship, had previously "behaved inconspicuously". "The man is accused of making Islamist statements on the Internet using a false name and of revealing internal agency material in Internet chatrooms," the spokesman added. Die Welt also reported that the man was caught by an agency informant, with the pair having online conversations about a possible attack. BfV did not confirm which part of the intelligence agency the accused worked in, though German news magazine Der Spiegel said the man was recently hired to observe the Islamist situation in Germany. It also reported that the man's family had no knowledge of his conversion, which the publication said took place in 2014. The BfV - the Federal Office for the Protection of the Constitution - is Germany's domestic intelligence agency. Its counterpart, the Federal Intelligence Service (BND), deals with foreign intelligence. There are an estimated 40,000 Islamists in Germany, including 9,200 ultra-conservative Islamists known as Salafists, the head of the BfV told Reuters news agency earlier in November. Germany attacks: What is going on?